On Friday, March 30, participants joined the Delphi Center for Teaching and Learning and the College of Arts and Science as New York University (NYU) Sociology and Education Professor Dr. Richard Arum presented "Learning During Unsettled Times: College Student Academic Performance and Recent Graduate Experience in the U.S"
In this presentation, Dr. Arum discussed updated findings from his recent book, Academically Adrift: Limited Learning on College Campuses, which explores undergraduate learning in college. Academically Adrift poses a fundamentally important question about America's higher education situation: are undergraduates really learning anything in college? According to Richard Arum and co-author Josipa Roksa, the answer is no. Students' lack of academic focus and disengagement between students and faculty have led to low gains in student learning. Arum and Roksa's research is comprised of survey responses, transcript data, and results of the Collegiate Learning Assessment (CLA), a standardized test administered to students in their first semester and then again at the end of their second year. The sample was made up of more than 2,300 undergraduates at 24 institutions. Arum and Roska found that while students may be acquiring subject-specific knowledge or greater self-awareness, three semesters of college barely had a noticeable impact on 45% of students' critical thinking, complex reasoning and writing skills. In recent cohort of students, Sociologists Barbara Schneider and David Stevenson have described the prevalence of "drifting dreamers" with "high ambitions, but no clear life plans for reaching them." These students have limited knowledge about their chosen occupations, about educational requirements, or about future demand for these occupations. They enter college, we believe, largely academically adrift. To what extent do college students improve their critical thinking, complex reasoning and writing skills over four years of college? Is social background associated with inequality in higher education learning outcomes? What college experience and contexts are associated with greater rates of learning? How are these college graduates faring today during these difficult economic times? Richard Arum is a professor in the Department of Sociology with a joint appointment in the Steinhardt School of Education at New York University. He is also the director of the Education Research Program of the Social Science Research Council and the author of Judging School Discipline: The Crisis of Moral Authority in American School. Arum, R. (2011). 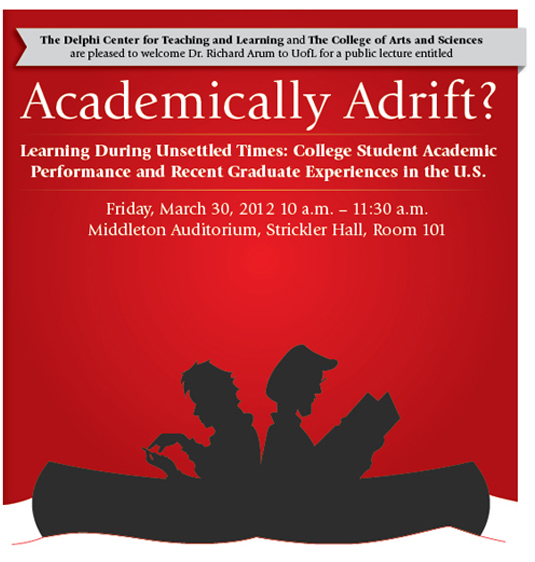 Academically adrift: Limited learning on college campuses. Chicago, IL: University of Chicago Press.